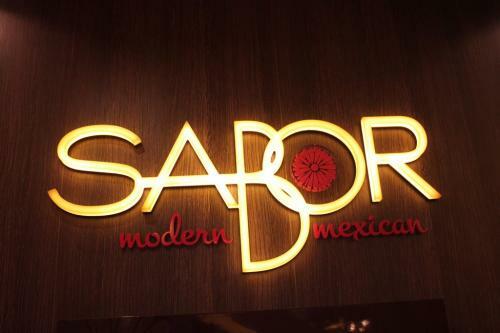 The newest specialty restaurant to be added to Royal Caribbean's fleet is Sabor Modern Mexican, described as a contemporary twist on traditional Mexican food. 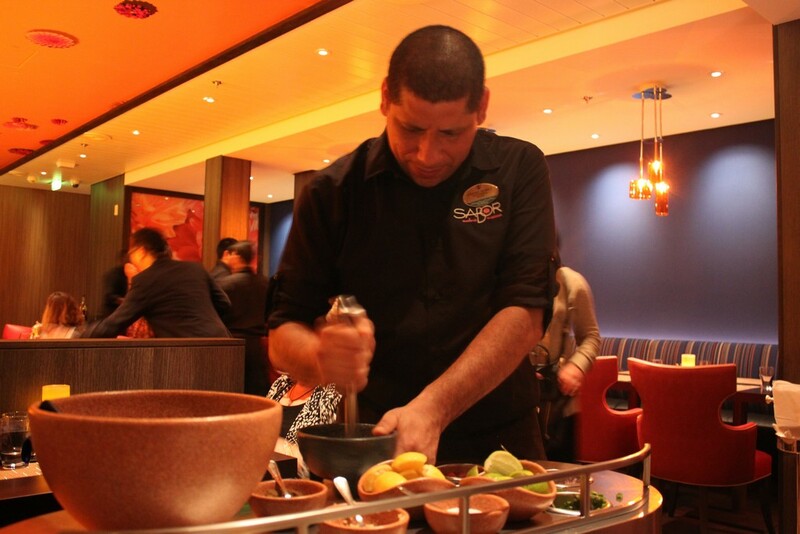 Sabor first debuted on Navigator of the Seas in February 2014 and we had a chance to try her our to see what exactly "modern Mexican food" really is. The short answer is it means amazing food. 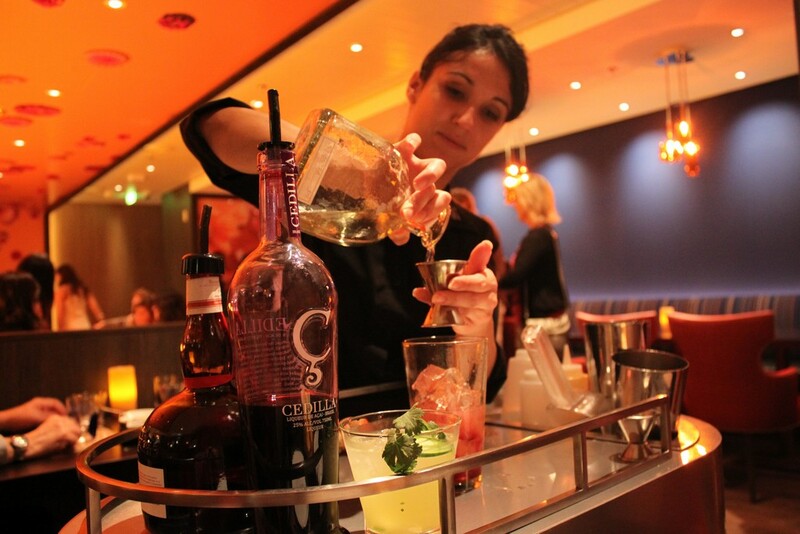 Located on deck 4 of Navigator of the Seas, Sabor is in the former Dungeon nightclub. Unlike any of the other specialty restaurants on Navigator of the Seas, there are no windows to the sea so its a dark establishment with lots of red, yellow and brown colors around you. 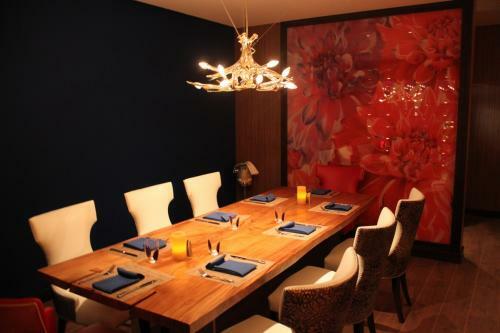 It looks like the designers wanted a chic look, so the decor in Sabor is definitely not like your favorite Tex-Mex place down the street. No maracas, sombreros or cactus' here. When you walk into Sabor, you will see the restaurant is divided length wise by a divider, with the section farthest from you the longest. It's not a giant restaurant but certainly not the smallest specialty restaurant either. The modern look is what Sabor emphasizes and we found the atmosphere eating in Sabor to be like that of a new restaurant that opened up that everyone is talking about. 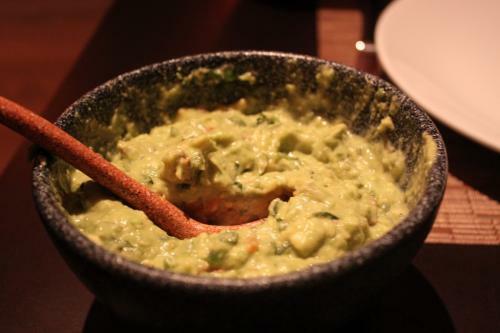 Once you're seated in Sabor, you get the usual menu but one of the complimentary things you will receive is guacamole made right at your table. A waiter brings a cart of ingredients around the restaurant and stops eat each table to explain how guacamole is made and shows you as he/she does it right in front of you. The output is some of the best guacamole I've ever eaten. Combined with the chips that are also freshly made (I could see the oil on them from the creation process), it's really quite tasty. Part of what Sabor tries to do with modern Mexican food is to make sure everything you order is made fresh. There's a large emphasis placed on how fresh the food is and any foodie will tell you fresh food always tastes the best. 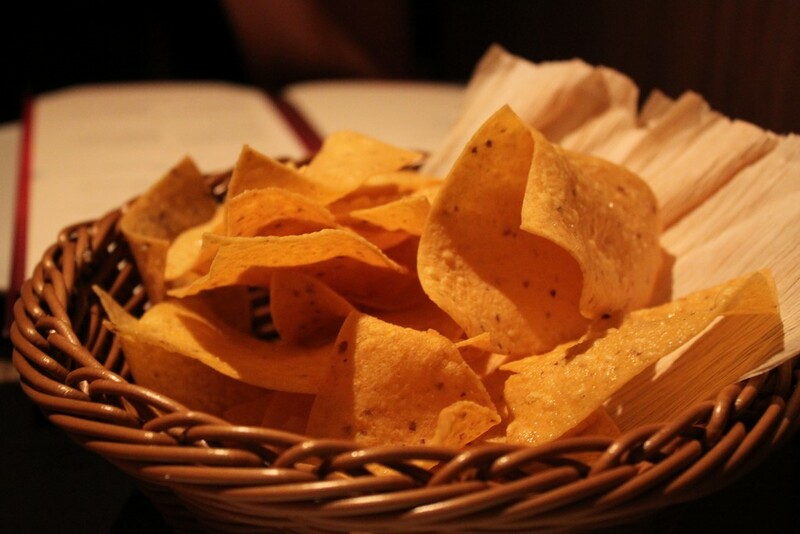 There's also freshly made salsa available as well that is complimentary and it too was quite good. 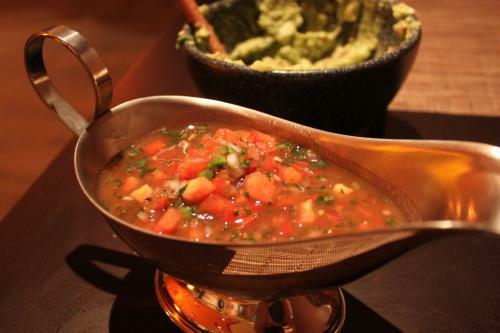 I'm a salsa fanatic and for me, there is no such thing as too much salsa. The salsa I sampled was terrific and like the guacamole, some of the best I've ever had perhaps. 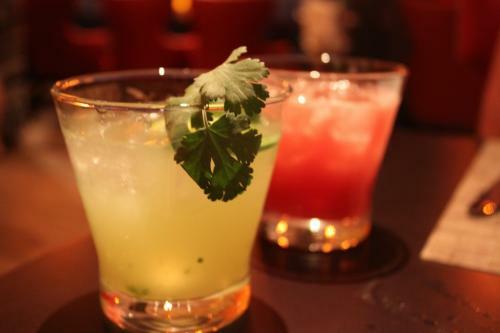 Speaking of food made at your table, Sabor also features two margaritas that if ordered can be created at your table as well for $12 each. There's a margarita cart that will come around to create either the sweet and spice margarita or the Sabor Grand Margarita. There are a number of other margaritas available, although they are not made at your table. Just like the guacamole cart, the margarita waiter explains how the drink is created and pours it for you on the spot. Once again, a very tasty margarita albeit an expensive one. Sabor also features a number of tequilas and tequila flights to choose and if you enjoy a good tequila, there's no question this is the place onboard your Royal Caribbean ship to sample one. Unfortunately there isn't a way to have a tequila or three without going to the restaurant and paying the cover charge. Moving onto the food, there's a lot to choose from the menu. 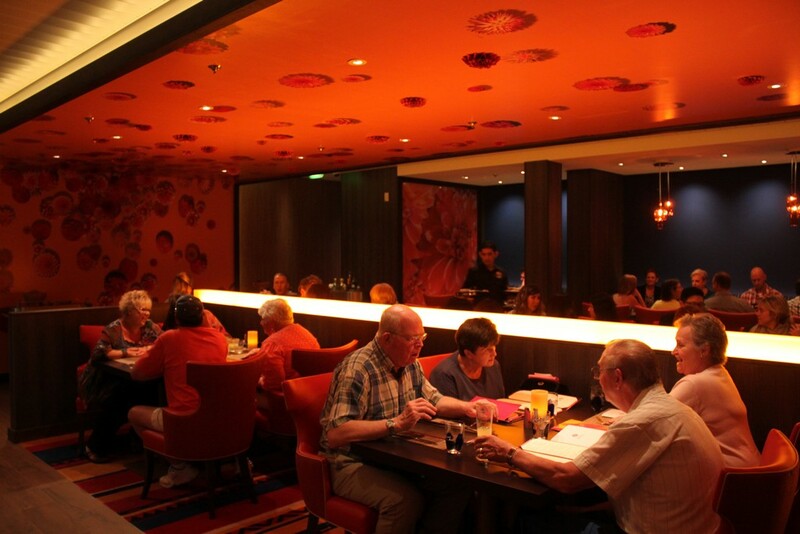 Like most specialty restaurants on Royal Caribbean ships, you can choose as many dishes as you care to order. 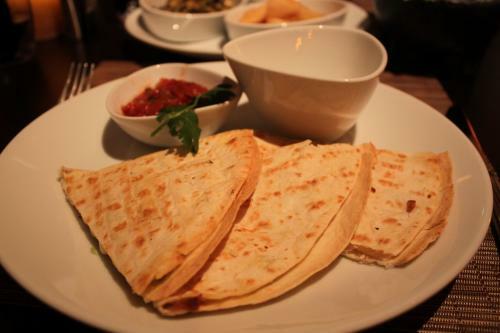 The menu offers some traditional Mexican items like tacos and burritos as well as "platos fuertes", which are more authentic Mexican fare. Assuming you did not fill up on the guacamole and salsa earlier, there are a number of appetizers to consider. We tried the Queso Fundido, Oaxacan Ceviche of Red Snapper and Sopa de Tortilla. 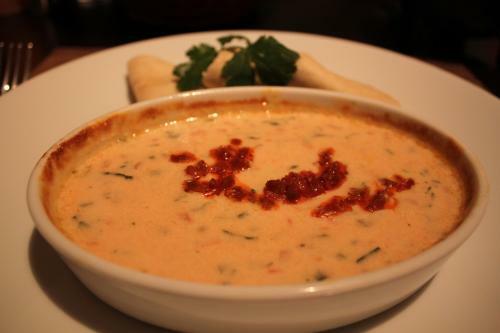 The queso fundido is your typical cheese dip with a myriad of vegetables mixed into a block of Mexican cheese that is melted down. Perfect for dipping chips in, the queso was above average what you may find at a Moe's or Chevy's. The ceviche was a small serving of fish and fruit and once again, you could taste the freshness of both. It was light and quite tasty. 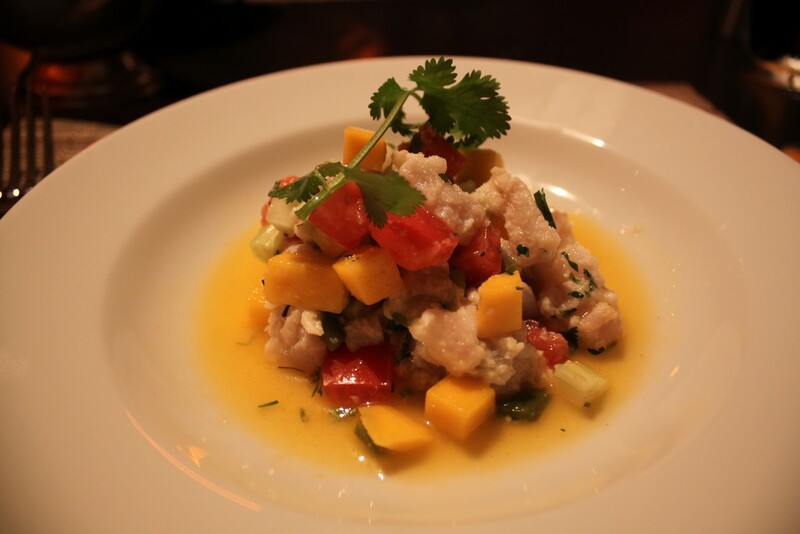 I think it's a good sign when the reviewer finishes the entire dish alone, and this was the case with the ceviche. Also unusual was the tortilla soup. 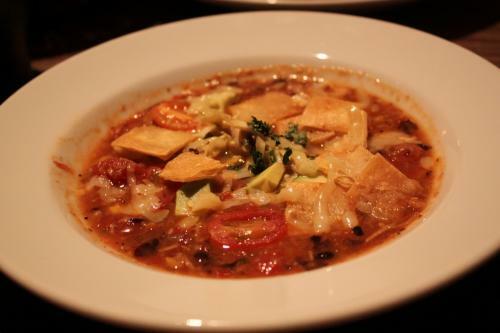 I've had a lot of tortilla soup in my day and this was by far not your typical tortilla soup. I felt it was more like Mexican minestrone soup to some degree but aside from its appearance, it was really quite tasty. It was one of those dishes that is so different than what I'm used to that it's hard to compare but the bottom line is it was good. By the time you get to your entrees, you might be getting full. We had to force ourselves to stop eating the guacamole and salsa to save room for our main courses. Our waiter recommended the chicken and roasted corn empanada and give that I wanted to try something other than a taco, this sounded great. The empanadas are fried chicken and corn in a green mole and peanut sauce. The menu says spicy but I didn't find it spicy at all. A little kick but nothing I'd warn anyone about. 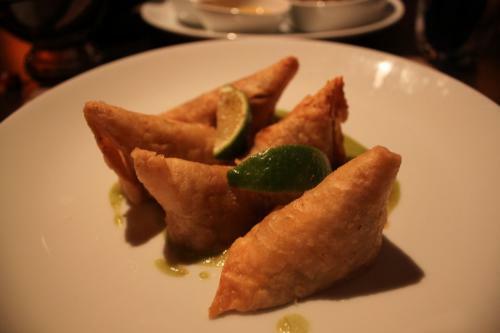 The empanadas reminded me of a Spring roll that you might find at a Chinese or Thai restaurant. It was a small dish and definitely something different than what I've ever had. Still, it was quite good and with a little leftover salsa that I put on top, I found this to be really good. My wife ordered the tres quesos quesadilla, which came out just like she wanted. I found them a little bland on their own but when dipped in the provided salsa (or dip it in the guacamole), it was a big hit. Of course there are also side dishes that are really meant to be shared family style with everyone at the table. 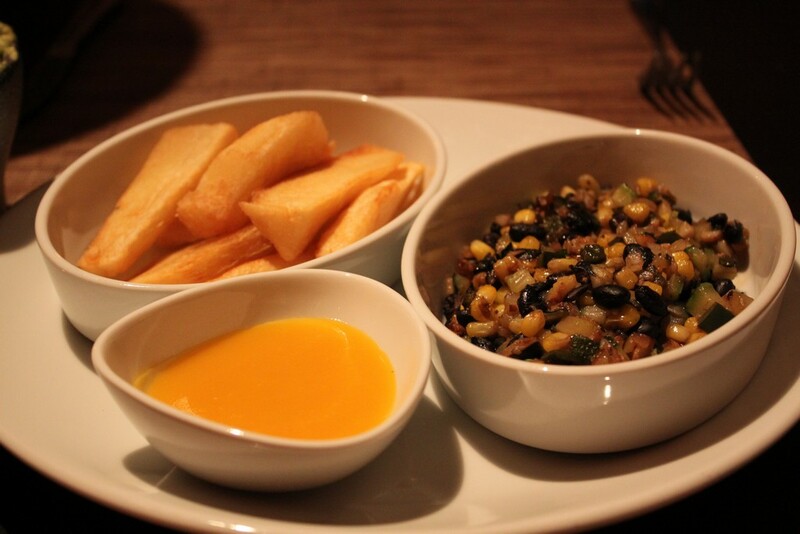 Yuca fries were interesting, reminding me a lot of plantains. The calabacitas (zucchinim roasted poblano pepper corn, black beans) sounded better than they tasted. I was trying to be adventurous but I think simple Mexican rice would have been a better choice. 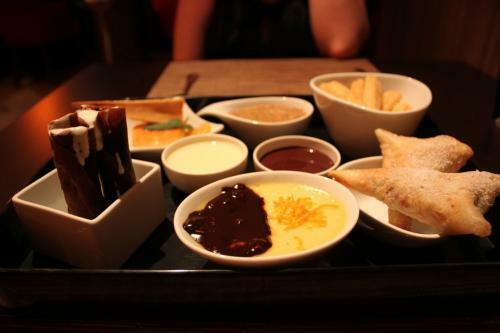 Did we mention dessert yet? If you manage to save room, the good news is Sabor made the dessert ordering decision for you because each table gets an assortment of desserts to share. I think the shared dessert idea is great because most often in my experience, desserts are something you want to share and something you rarely finish on your own. Everyone raved about the chocolate banana empanadas, which I enjoyed too despite my aversion to cooked bananas. Let me be blunt: Sabor was my best meal I've ever had on a Royal Caribbean cruise. Period. The quality and taste of the food blew us away and I think it's going to be a massive hit. In just the two cruises Sabor has been open, the staff at Sabor reported they've been busy every night with customers and I think it makes perfect sense. The cost is $25 per person, and I've read plenty of people who think it's too high for Mexican. I think you can easily get your moneys worth and if I had to pick a Royal Caribbean specialty restaurant to eat at tonight, it would be Sabor. The freshly made food really stands out and the quality of the food was impressive. Sabor is one of the initiatives of Royal Caribbean's new head of food and it along with the new Chops menu is part of the new wave of restaurant choices coming to ships. If Sabor does well, you can expect it to be added to other Royal Caribbean ships, most notably Quantum of the Seas. I was quite impressed with my meal at Sabor and for the rest of the cruise, we wished there was an option to eat at Sabor for just the guacamole and chips or the drinks. To me that says a lot when you want to go back again that quickly. Sabor Modern Mexican is open for dinner between 6:00 p.m.-10:00 p.m. and we reviewed Sabor Modern Mexican aboard Navigator of the Seas.